Wash the curry leaves & drain it. Wipe the excess water using the paper tissue. Spread the curry leaves in a plate, on the micro oven 3 mins in high. Heat the pan, add urad dhal & dry roast until golden brown. Heat oil in a pan add red chillies & roast it & keep it aside. Take a blender add red chillies, urad dal,salt & grind to a course powder. 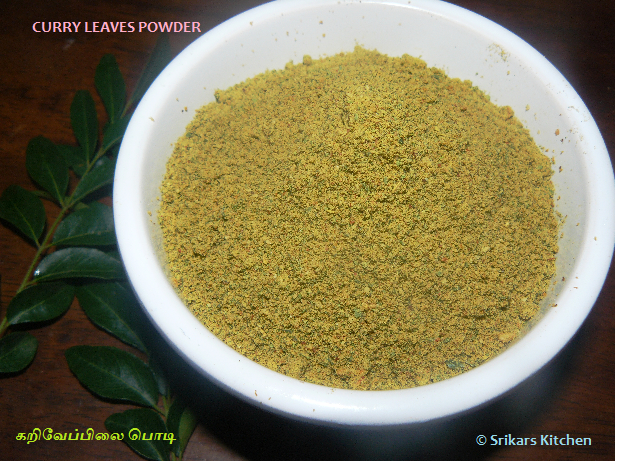 Add curry leaves & grind to a almost fine powder. Serve with hot rice, ghee & papad. looks sooo healthy n delicious. Hey thank you for visiting my space u have a lovely blog just now was scrolling through ur recipes. Good collection. thats a very very flavorful podi :) and a healthy one .. wud love to have them with steamed rice !! One of my favourite podi..Love with some rice topped with ghee.